Single Family Residence, Cape - Centerville, MA Located at the very end of Elliott Rd affording the ultimate in privacy and encompassing over 5 acres of land in a beautiful and lush natural setting. This 4 bedroom home boasts over 3400 sq. ft. of living space and a finished lower level offering over 1000 sq. ft. of additional living area and a full bath . 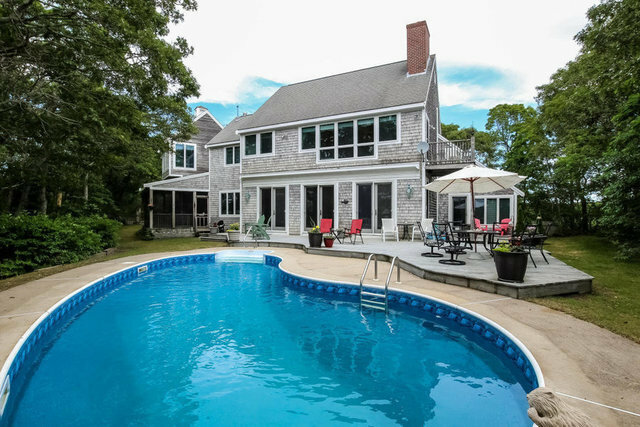 The inviting in-ground pool overlooks the marsh and path that leads you to the water's edge. An expansive open floor plan includes a large kitchen area with granite counters and marble floors, formal dining room, breakfast nook, enclosed porch and spacious living room overlooking the back yard. Central AC, 2 car garage and gas heat are some of the additional highlights this extraordinary home has to offer. This is a unique home in an equally unique and remarkable setting.